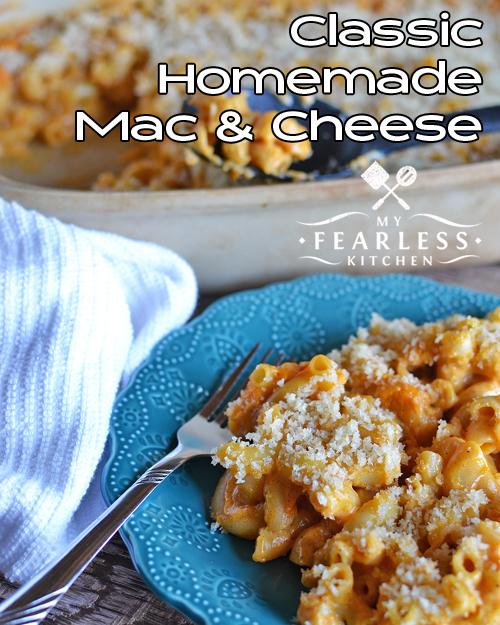 This Classic Homemade Macaroni and Cheese recipe uses a homemade cheese sauce, but it’s so easy you’ll want to make it all the time! 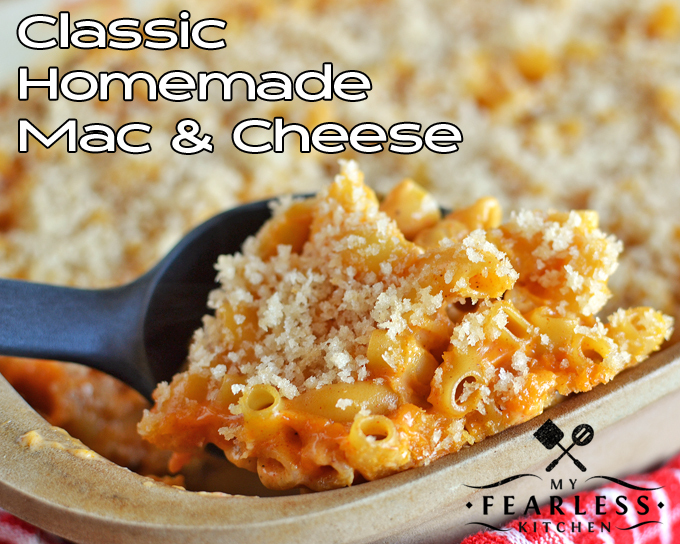 We used to have this Macaroni and Cheese recipe when I was growing up. It is still one of my go-to comfort foods! I like to use the large elbow pasta in my mac & cheese. 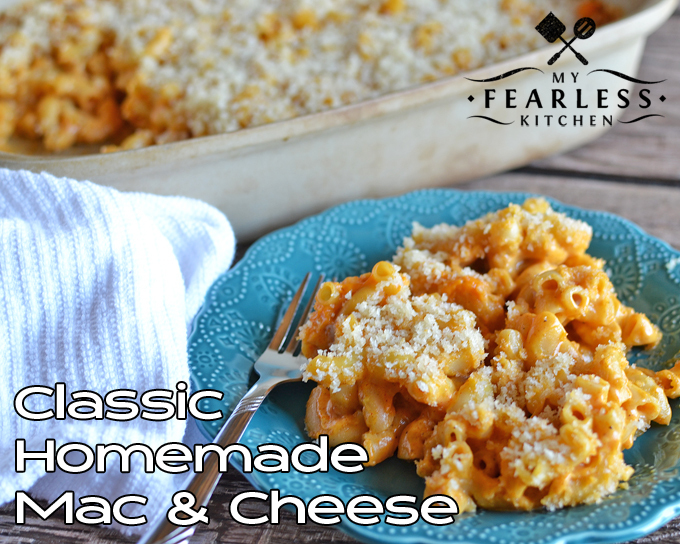 You pick the shape that you like – small elbows, shells, cavatappi (like in this Garlic-Parm Mac & Cheese). This post has some tips for choosing the “right” types of pasta for different recipes. I love to make this cheese sauce! Tell people that you used a homemade cheese sauce and they will be super-impressed… I won’t tell them how easy it is! It does take a little bit of time, and a lot of stirring. If you use a giant stockpot like mine to cook your pasta, your pasta will be cooked and your sauce will be ready right about the same time! The biggest trick to the cheese sauce is to get everything ready before you start. Measure out the flour and seasonings, and get the Velveeta all cubed up. Once it starts to get hot, everything happens pretty quickly… and then you have time to be patient and stir again. Use a big saucepan like this one, and make friends with your whisk! You’ll want the whisk to make a paste with melted butter, flour, and seasonings. And whisk as you’re pouring the milk into the paste – whisking will help the paste incorporate into the milk and you won’t end up with a lumpy sauce. I love a good crunchy top on my baked mac & cheese, so I use buttered Panko bread crumbs. If you don’t like Panko (or don’t have any handy), try crushed corn flakes or crushed Chex cereal. Mix the crumbs with melted butter, and sprinkle them over the top. After the macaroni and cheese bakes, you can turn on the broiler for a few minutes to get the top nice and brown. I have been known to eat a big plate of this macaroni and cheese as a meal all by itself… But you probably should pair it with something. You could brown a pound of ground meat and mix it in with the macaroni and cheese sauce before you bake it. (I would recommend ground beef or ground pork.) Or you could make up a simple main dish to go with it. What favorite comfort food do you remember growing up? This Classic Homemade Macaroni and Cheese recipe uses a homemade cheese sauce, but it's so easy you'll want to make it all the time! In a large stockpot, cook pasta according to directions on box. Cook pasta al dente. Drain, and place pasta in a lightly greased 9x13 baking dish. While pasta is cooking, make cheese sauce. Prepare all ingredients before starting. Add flour, paprika, salt, and pepper to melted butter, whisking until a paste is formed. Add milk to the paste, whisking as you pour the milk. Whisk until the paste and milk are combined. Heat milk mixture until it starts to thicken and bubble on the edges, stirring frequently. When the milk mixture starts to thicken, add the cubed Velveeta, about a quarter of the cheese at a time. Stir frequently, and let the cheese melt before adding more. Once all the cheese is melted, pour over the cooked pasta. Stir well to combine. In a microwave-safe bowl, melt 3 Tablespoons butter. Add Panko bread crumbs, and mix with a fork to combine. Sprinkle Panko crumbs on top of macaroni and cheese. Bake, uncovered, at 350 degrees for 15-20 minutes, until hot and bubbly. If desired, turn on broiler for 2-4 minutes until top is brown and crunchy. This very similar to Mom’s cheese sauce recipe from her 1943 Joy of Cooking. It also calls for “a few grains if cayenne” and an optional 1/2 t dry mustard. She would love seeing this?